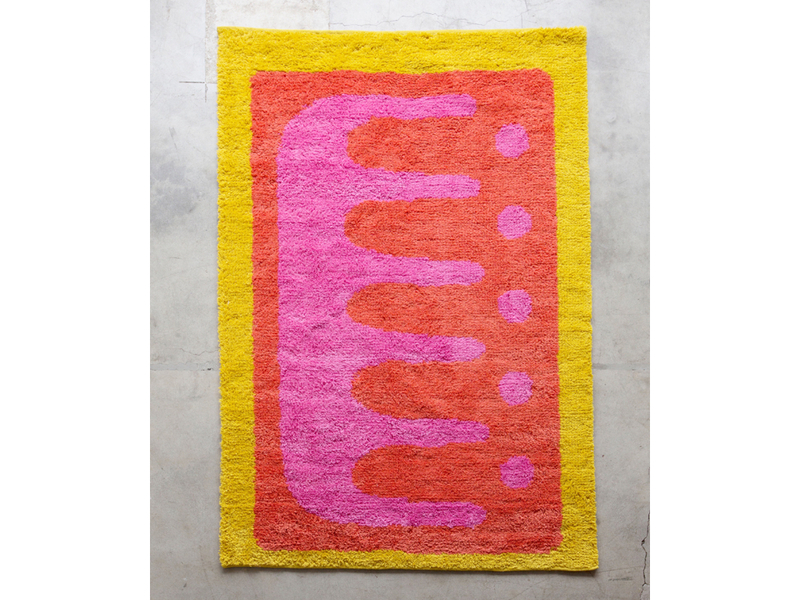 Block Shop’s first line of hand-tufted wool rugs includes this wild fuchsia-and-banana-hued gem. How does Block Shop, the frustratingly cool L.A. textile studio cofounded by siblings Hopie and Lily Stockman, come up with its patterns? Hopie described their design process to the Los Angeles Times last year as a “weird, ‘sister brain’” method of passing ideas back and forth between them until they decide it’s done. The subtly trippy results—marked by snakelike squiggles, half-circles, and dots—grace quilts, scarves, dhurries, and other surfaces dyed the dazzling hues of a Joshua Tree sunset. Each pattern is first sketched and drawn in watercolor by the women, then translated to textiles by master artisans using hand-carved wood blocks in a town just outside of Jaipur. 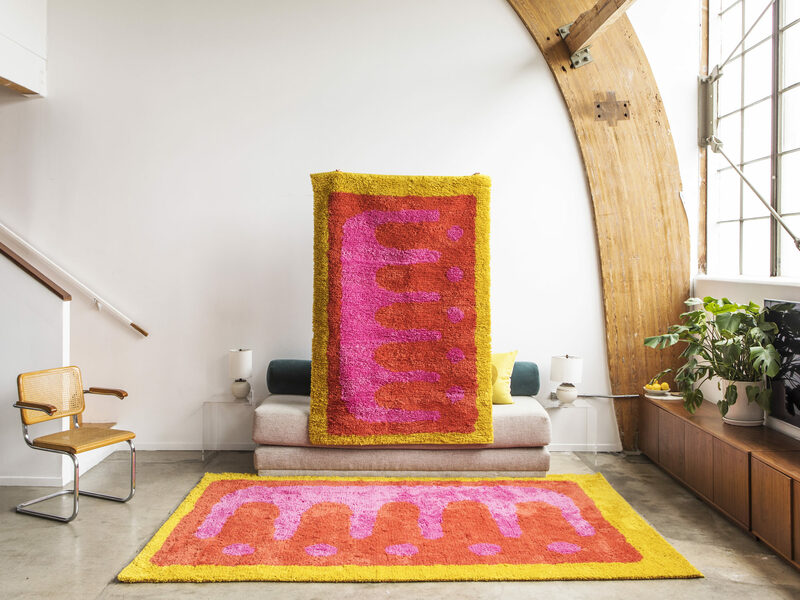 Earlier this month, the Stockman sisters made their NYCxDesign debut at Sight Unseen Offsite, where they presented a line of hand-tufted wool rugs in a makeshift reading room (peony-pink bookmarks were offered as souvenirs). This wild Comb rug hung on the wall, which, like all Block Shop floor coverings, was handmade over the course of several months by master weavers in Jodhpur (all its pieces are made in India) and channels the sisters’ pared-down version of Southern California style. 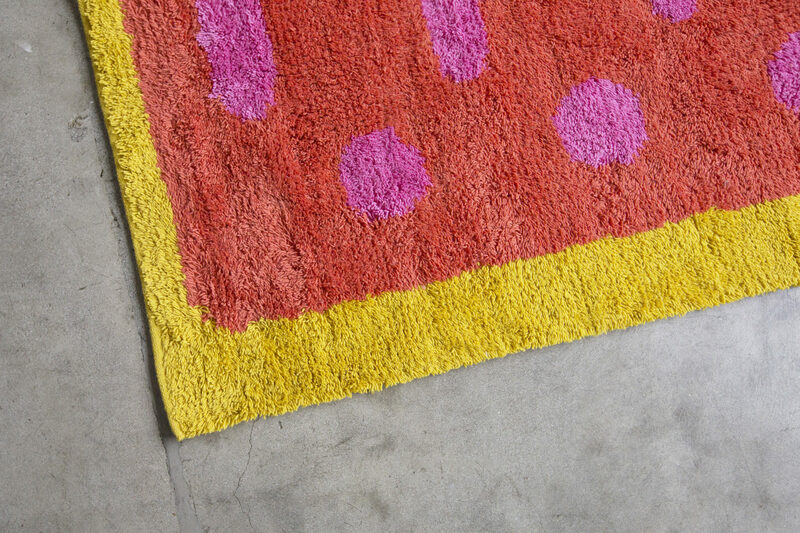 Every object has its own narrative, too: According to a press release, Hopie and Lily see Comb’s design as a “pink stucco art deco co-op enveloped in bougainvillea.” To the casual admirer, it may simply look like a really awesome shag rug. Both assessments are valid.